In politics, a landslide describes an electoral victory in which a candidate wins by a sweeping majority of votes. In the election of 1948, Thomas E. Dewey, who was the U.S. Republican presidential candidate running against Harry S. Truman, was predicted to win a landslide victory. However, despite the assurance of pre-election polls, commentators, and journalists, Truman was the one who ended up winning the election, surprising many experts. The wrong predictions were made famous by the headline of the Chicago Daily Tribune, printed early in the morning of November 3, 1948, before the final results were clear, which read "Dewey Defeats Truman". 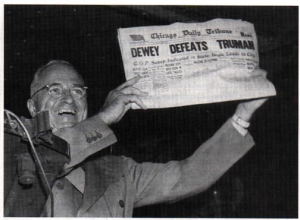 A few hours later the newspaper corrected the mistake by printed a second edition announcing Truman's unexpected victory, but a copy of the early edition had already found its way to the hands of the elected president, who posed with it in what became a historical photograph that to this day stands as an iconic representation of embarrassing media mistakes. "President Truman holding the Chicago Tribune headline 'Dewey Defeats Truman', November 3, 1948" by David Ericson is licensed under CC BY. Much-Is-A-Landslide.htm, accessed April 21, 2015. 2015 Dewey Defeats Truman. Chicago Tribune Online.